Island Harvest came together with corporate partners to outline steps being taken to ease the burdens of federal employees. As the 21st shutdown to hit the U.S. government began, workers may not have expected it to break a record as the longest in history. As of Thursday – one month and two days in – over 800,000 federal employees have not received salaries. The sudden loss of pay has disrupted employees’ financial situations, leaving many unable to meet the bills and buy food. Local food banks, like Island Harvest, have stepped up, providing food and additional resources. The mission of Island Harvest is to help Long Islanders struggling with food insecurity and poverty, while responding to disasters and emergencies. The organization has classified the shutdown as an emergency, encouraging employees to reach out if they need assistance with food or bills. Dresner finds it “unfortunate” that workers must face hardships, while the government battles over the budget. Many have expressed they love their job and are eager to go back. 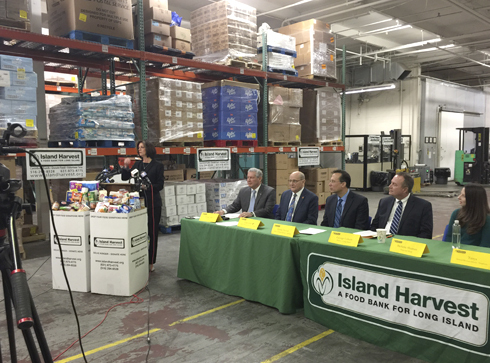 Island Harvest President and CEO, Randi Shubin Dresner speaks during a press conference at the food bank to discuss ways the organization can help federal workers who may need assistance during the partial government shutdown. Island Harvest has food banks in Bethpage, Uniondale, and Hauppauge, along with mobile food pantry units that go where there is need. Dresner recommends those with food insecurity call 516-294-8528 to be directed to the nearest site. Additionally, Island Harvest makes signing up for SNAP simple; federal workers can apply over the phone. SNAP would give workers an allowance for groceries to help them get through the shutdown. Corporate partner PSEG is allowing a 60-day grace period, with no late fees, for federal employees. Call 800-490-0025. Teachers Federal Credit Union is offering loan payment extensions and other assistance to affected members. And impacted families can apply for free or reduced-price school meals for their children. Resources can be found at islandharvest.org. In addition to Island Harvest, Long Island Cares’ Harry Chapin Food Bank at 220 Broadway, Huntington Station, is offering help. The pantry is open Monday and Wednesday, 9 a.m. - 3 p.m., and Friday, 9 a.m. - 5 p.m.. Call 631-824-6384.